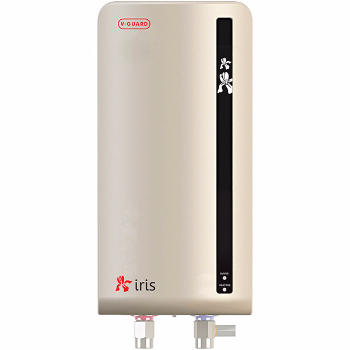 This efficient instant water heater is built to withstand a working pressure of up to 6.5 Kg/cm2, with a sturdy heating element for a long, durable life. Its outer body is designed to stay rust proof while its inner tank is made using 304 grade, high quality Jindal stainless steel. The water heater uses PUF insulation in order to minimize heat loss.Its inbuilt safety systems make it safe and easy to use. To Recieve updates and possible rewards for V-Guard Iris please sign in. To Recieve updates and possible rewards for Geyser/Water Heater please sign in.